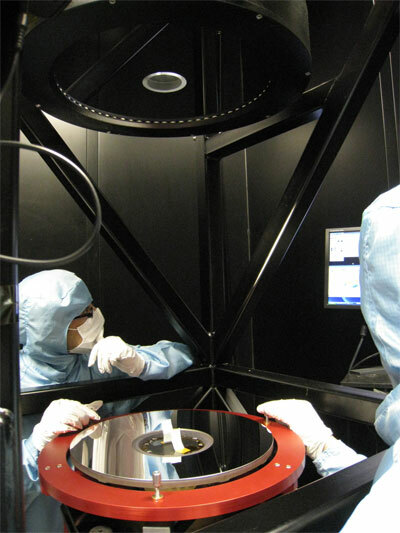 Optical Surfaces supply reference and coated flat mirrors worldwide and regularly supply precision alignment devices for optical and engineering purposes. Our thermally stable environment makes us pre-eminent in flat measurement technology. As a part of the package for SSTL’s very high resolution, Nigerian Sat-2 Satellite system, Optical Surfaces supplied a reference flat. The purpose of this flat was to check the accuracy of the integration of the main mirrors into the payload structure. The mounted mirror had a diameter of 475 mm, was cored with a large central hole and had to have an accuracy of λ/20 PV @ 633nm. One of the requirements for the mirror performance was that it be tested laying in a horizontal configuration. This constraint necessitated the construction of a custom Fizeau interferometer that allowed correcting for gravitational forces. The satellite was launched in August 2011, is operated by the Nigerian Space agency and has produced spectacular results. Following on from the success of this mission the reference flat will be used for future space projects.